Today on the occasion of 53rd anniversary of Tibetan Democracy Day, the Kashag, on behalf of the people of Tibet, offer our heartful reverence and gratitude to His Holiness the Great Fourteenth Dalai Lama and extend warm greetings to all fellow Tibetans, both inside Tibet as well as outside. Fifty-three years ago, it was on this day, that the first Tibetan people’s representatives took oath of office at Dharamshala, India. This was the initial step towards a future in exile, guided by the principles of democracy envisioned by His Holiness the Great Fourteenth Dalai Lama of Tibet. Bereft from the loss of their country, Tibetans were uplifted by His Holiness the Dalai Lama’s wisdom and prescience. His vision of a democratic Tibetan society empowered them to work towards preserving their culture, language, religion and way of life, thus establishing a solid foundation upon which the community sustained its identity in exile. Buddha Shakyamuni had already introduced the revolutionary concepts of social equality and democratic processes within the Sangha more than 2500 years ago. At the tender age of seventeen, His Holiness the Dalai Lama, while in Tibet, established a Reform Committee to alleviate the burden of indigent Tibetans and poor farmers by reducing their taxes and by re-distributing land equitably. However, the objectives of the Reform Committee could not be fully realized due to several external as well as internal factors. Under the guidance of His Holiness the Dalai Lama, Tibetan democracy in exile evolved over the years with major landmark decisions: establishment of Tibetan Parliament in 1960, the framing of the Constitution for future Tibet in 1963, the adoption of the Charter for Tibetans in exile in 1991 and the direct election of Kalon Tripa in 2001. Each of these accomplishments has prepared Tibetans for His Holiness the Dalai Lama’s devolution of political authority to the democratically elected leadership in March 2011. 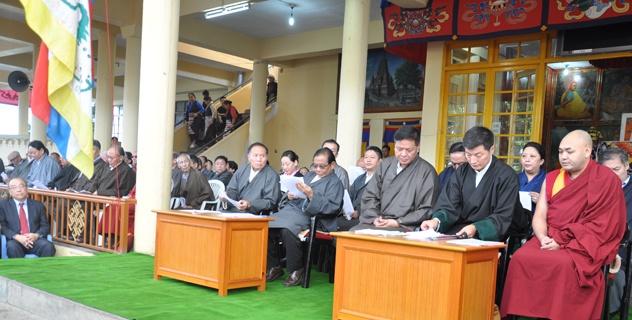 On the day of Kalon Tripa’s inauguration on August 8, 2011, Ka-dham Si-shi De-kyi ma, the official seal of the Kashag created by the VIIth Dalai Lama in 1751, was handed over to the democratically elected Kalon Tripa, thus ensuring both historical legitimacy and continuity in leadership. These significant achievements have taken place in India, a land with a deep understanding and practice of democracy. When His Holiness the Dalai Lama visited India in 1956, he found that the principles of social equality and democratic processes were inherent in the Indian governance system. His Holiness the Dalai Lama was impressed with the robust debates within the multi-party Indian parliament. India exemplifies the concept of unity in diversity. Despite a diverse populace of different faiths, languages and customs, India remains rooted and united in democratic ideals. This unity in diversity has been conducive to developing a thriving and evolving Tibetan democracy in exile. Words cannot adequately express our gratitude towards India. In the wake of this historic devolution of political authority, the present Kashag faced a formidable challenge of ensuring a smooth transition and of taking the Tibetan struggle forward. We thus presented a CAN strategy: Consolidation, Action and Negotiation, an integrated three-phased strategy. The international community also took note of the transition. The International Network of Parliamentarians on Tibet stated, “It is remarkable that an exiled refugee community has been able to organize, for many decades, such an orderly managed democratic exercise.” The US Senate Resolution 356 acknowledged that the direct election of Kalon Tripa was “competitive, free, fair and met international electoral standards.” The European Parliament resolution of June 14, 2012 commended the very important and successful democratization process in the governance of Tibetans in exile by His Holiness the Dalai Lama and the recent transfer by him of his political powers and responsibilities to the democratically elected Kalon Tripa of the Central Tibetan Administration, which represents the aspirations of the Tibetan people. The most significant expressions of approval and support came from Tibetans inside Tibet through their songs, thangkha paintings and offerings of prayers. The situation inside Tibet, as you know, continues to be grim. This is reflected in the alarming incidents of self-immolations, now numbering 120, including 22 in 2013 alone. 103 of them have died. The only way to end this heartrending and grave situation is for China to respect the aspirations of the Tibetan people: freedom for the Tibetan people and the return of His Holiness the Great Fourteenth Dalai Lama to Tibet. We firmly believe that the Middle-Way Approach is the only way, as the basis for negotiations, to peacefully resolve the issue of Tibet. The Middle-Way Approach traverses the middle path between the two positions: one, accepting the current repression in Tibet and two, seeking separation from the People’s Republic of China (PRC). Such an arrangement does not challenge PRC’s sovereignty and territorial integrity, two of its core concerns. We hope that the Chinese leadership will take note of the merits of this approach and resolve the Tibet issue, so that we can end the suffering of Tibetans inside Tibet. It is also in China’s interest to peacefully resolve the Tibet issue as it will help boost its international image and add to its much-needed soft power. The 26th meeting of the Task Force on Negotiations will be held in the coming days. Tibetans in exile and in the diaspora must rise to the occasion. We strongly urge all of you to exercise your democratic rights and responsibilities diligently, bearing in mind the need for solidarity and unity with the sufferings of Tibetans in Tibet. On the 53rd anniversary of Tibetan Democracy Day, the Central Tibetan Administration re-affirms its resolve to work in unity to fulfill the aspirations of Tibetans inside Tibet. We call upon all Tibetans to join us in this effort and take this opportunity to thank, on behalf of the Kashag, all our friends for their support and cooperation. Together, we can and must march forward.